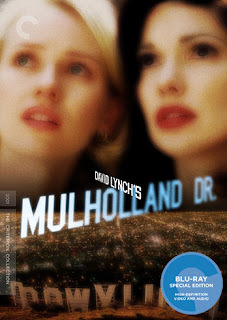 Blu-Ray Review | "Mulholland Dr."
I was probably 14 or 15 the first time I saw David Lynch's MULHOLLAND DR. It was the first time I had been exposed to cinema that lay outside the typical narrative conventions, and I haven't been the same sense. When I think of the first decade of this century, there are three films that come to mind as the top of the pantheon of great cinema - Paul Thomas Anderson's There Will Be Blood, Lars Von Trier's Dogville, and this. Revisiting the film now, 15 years older and more familiar with the world of surrealist filmmaking (and Lynch's oeuvre in general), I am still floored at the sheer power of Lynch's masterpiece. When I first saw the film as a teen, I didn't really understand it, but I knew I had seen something special, something brilliant, something that operated on a completely different level that anything I had ever seen before. I was able to follow its mysteries of Lynch's beautiful puzzle box better than I had before. It's a haunting, disturbing tale of doomed love, jealousy, and faded dreams in the city of light. Naomi Watts is a plucky young starlet looking to realize her dream of becoming an actress (and in the process gives one of the all time great performances). Laura Harring is a troubled amnesiac who is trying to discover her true identity after a car accident robber her of her memory. For the first two hours, we think we're watching two women search for one's identity. Then Lynch unlocks the blue box and plunges us down the rabbit hole, pulling the rug out from under us and upending everything we've already seen. This is David Lynch's Persona, a pyscho-sexual exploration of memory and identity that is clearly the work of an artist working at the height of his creative powers. Mulholland Dr. represents a singular vision in service of a seemingly straightforward film noir, warped through Lynch's own unique psyche. Sometimes words don't quite suffice. This is a film that needs to be experienced. Lynch's films are something you feel in the pit of you stomach, in the raised hair on your arms, in the depths of your soul. This is one for the ages, and the Criterion Blu-Ray is a godsend for Lynch fans and cinephiles in general. Lynch has long been underrepresented on Blu-Ray, and having his most beautiful film in high definition is a dream. If you're looking for more answers to the film's questions you may be disappointed, as the in-depth interview with Lynch excerpted from Chris Rodley's book, Lynch on Lynch, really only serves to muddy the waters. But that's always been Lynch's intention. His films are many things to many people, and he's never been one to take that experience away from us. What we are left with a beautiful mystery, one that isn't quite as impenetrable as its reputation suggests, perhaps, but one with so many layers and questions that we may never fully answer and explore them all. It's easily one of the year's must-own discs. Review | "Jafar Panahi's Taxi"/"The Pearl Button"
Review | "The Forbidden Room"
Review | "He Named Me Malala"
Blu-Ray Review | "Diary of a Lost Girl"